Government mandates and patient safety and quality tied for second place in ACHE’s survey of top issues facing health systems. Workforce shortages came in third. No matter which cog in the healthcare system one blames for the skyrocketing costs of healthcare (big pharma inflating the list prices of drugs; hospitals for upmarking services; insurers for leaving gaps in care resulting in surprise bills) consumers’ pocketbooks aren’t the only ones affected. “The survey results indicate that leaders are working to overcome challenges of balancing limited reimbursements against the rising costs of attracting and retaining talented staff to provide that care, among other things,” ACHE president and CEO Deborah Bowen said in a statement. And 70% of hospital CEOs were worried about shifting CMS regulations in 2018, along with regulatory/legislative uncertainty (61%) and cost of demonstrating compliance (59%) — unsurprising, given the current administration’s track record of unpredictability. Highlighting a key implication of the rise in high-deductible health plans, both on the ACA exchanges and in employer-sponsored insurance, the article describes a question now commonly faced by doctors and hospitals—how best to collect their patients’ portion of the fees they charge? As one Texas doctor tells Bloomberg, reflecting the experience of the Maldonados from the other side of the equation, “If [patients] have to decide if they’re going to pay their rent or the rest of our bill, they’re definitely paying their rent.” He reports that the number of people dodging his calls to discuss payment has increased “tremendously” since the passage of the ACA. Another Texas doctor reports that his small practice had to add an additional full-time staff member just to collect money owed by patients, adding further overhead to his practice’s costs and making it more likely that he, like many other doctors, will eventually seek shelter by being employed by a larger delivery organization. That trend, as has been repeatedly shown, further increases the cost of care, exacerbating the increase in insurance costs for families like the Maldonados. 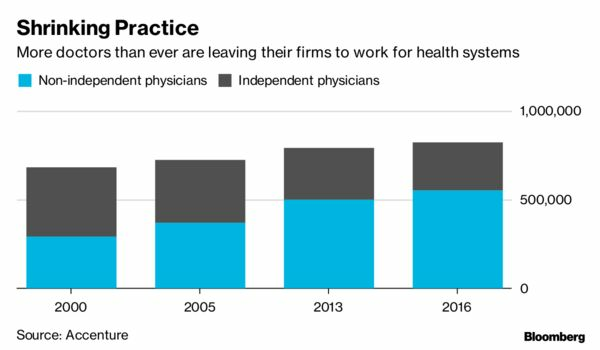 This Gordian knot of increasing costs, rising deductibles, and growing premiums has left us with a healthcare system that’s forcing difficult decisions at every turn, for patients and providers. Doctors, hospitals and medical labs used to be concerned about patients who didn’t have insurance not paying their bills. Now they’re scrambling to get paid by the ones who do have insurance. Northwell Healthcare Inc., a network of more than 700 hospitals and outpatient facilities, lost $106.9 million to unpaid services in 2015. Others have reported the same: Acute-care and critical-access hospitals reported$55.9 billion in bad debt for 2015, according to data compiled by the American Hospital Directory Inc.
A lack of OON benefits leads to never-ending financial obligations for patients and a greater likelihood of bad debt for providers. Surprise, sky-high medical bills have been irking patients and legislators a lot lately, but as the number of patients with out-of-network (OON) benefits shrinks, the problem of high bills will continue to grow, according to research from the Robert Wood Johnson Foundation. A lack of OON benefits leads to never-ending financial obligations for patients and a greater likelihood of bad debt for providers, according to Katherine Hempstead, PhD, senior policy adviser at the Robert Wood Johnson Foundation. Hempstead authored the new analysis, which looked at trends in OON benefits in the individual and small group markets. “Out of network benefits have become much less common, especially in the individual market, where the proportion of plans with OON benefits has declined from 58% in 2015 to 29% in 2018 in the individual market,” she tells HealthLeaders via email. “In the small group market, the decline was smaller: 71% to 64%,” she says. However, even plans that do offer OON benefits increasingly have very high deductibles and maximum out-of-pocket (MOOP) caps. For instance, in the individual market, the median OON deductible is approximately $12,000, the analysis shows. Some are even higher. “A sizable share of plans in the individual markets have OON deductibles that exceed $20,000, and have no MOOP, meaning that patient obligations can continue infinitely,” Hempstead says. For hospitals and health systems, all of this adds up to more patients who will be unable to pay their bills. “The takeaway for revenue cycle managers is that most customers in the individual and small group market have little or no out-of-network coverage,” Hempstead says. Because of this lack of OON coverage, hospitals and health systems should do some investigating beforehand. “It will be important to ascertain in-network status before providing services, or the likelihood of bad debt will be high,” Hempstead says. That’s something that hospitals and health systems can feasibly do, “especially if they have a price estimator tool,” says Donella J. Lubelczyk, RN, BSN, ACM-RN, CRC, CRCR, executive director of revenue cycle at Catholic Medical Center in Manchester, New Hampshire. “They would need to do this with the patient and make sure the patients understand their out-of-network costs prior to selecting the service(s),” Lubelczyk says via email. Patients also have a responsibility to know which providers are in and out of their networks. A recent HealthSparq survey shows that 40% of patients who received a surprise bill said they could have done more to better understand their benefits and healthcare processes. “Patients really need to understand their in-network plans, but most people do not and need to get assistance,” Lubelczyk says. Maine’s Republican governor is publicly laying out a proposed tax hike on hospitals to pay for voter-approved Medicaid expansion. Gov. Paul LePage’s office says Medicaid expansion will offset a tax hike by decreasing charity care and bad debt. Maine’s hospital tax rate is 2.23 percent, and Rabinowitz said Maine could go up to six percent. Maine Hospital Association lobbyist Jeffrey Austin previously told The Associated Press that Maine hospitals pay $100 million in annual taxes and would oppose an increase. Mainers voted last fall to expand Medicaid to 80,000 low-income adults. LePage’s administration is fighting litigation by advocates calling on the governor to stop blocking expansion. LePage vetoed legislation funding Maine’s share of expansion with surplus and tobacco settlement funds after he argued lawmakers must fund expansion without raising taxes. 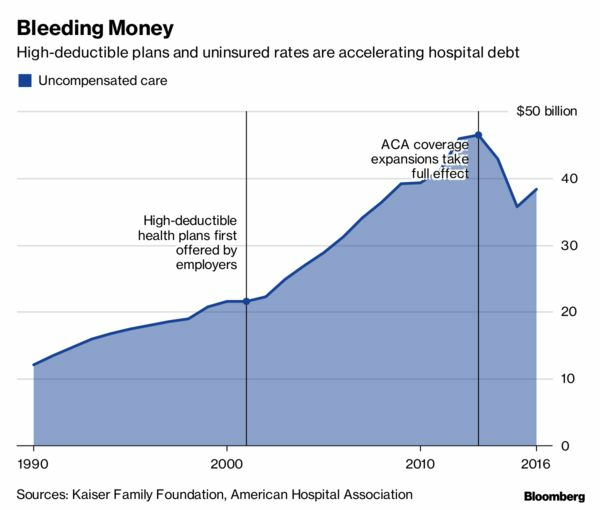 The trend even includes Medicare bad debt, which results when hospitals exhaust efforts to collect from beneficiaries and must be paid back. Hospitals continue to face financial challenges as the landscape shifts, and the challenge posed to hospitals by patient balances after insurance, or PBAI, is growing. That’s according to a new TransUnion Healthcare analysis that showed PBAI rose from 8 percent of the total bill responsibility during the first quarter of 2012 to 12.2 percent during the same quarter in 2017. Commercially insured patients experienced a PBAI increase of 67 percent from $467 to $781, the analysis showed. The rising trend fueled an 88 percent increase in total hospital revenue attributed to PBAI over the 5-year period. As patients take on more risk and shoulder more of their own healthcare costs, uncompensated care is also rising. TransUnion cited the American Hospital Association’s 2017 Hospital Fact Sheet, which said uncompensated care increased by $2.6 billion dollars in 2016, the first increase in three years. Rising PBAI has no doubt amplified bad debt for providers, contributing to that rise. Jonathan Wiik, principal for healthcare strategy at TransUnion, said he expects the figure to have risen in 2017 and again in 2018. The analysis also indicated that Medicare Bad Debt, which happens when Medicare patients don’t pay their deductibles and coinsurance, rose from $3.14 billion in 2012 to $3.69 billion in 2016, a 17 percent increase. If a hospital feels it has exhausted all efforts to get money from a Medicare beneficiary who has an outstanding copay coinsurance or deductible, and they have documented their efforts to collect, Medicare will actually pay the hospital back though not dollar-for-dollar. Wiik said Medicare pays about 65 cents on the dollar for that payback so the hospital still loses some money, about a third of the bill to be exact. “That’s a very scary thing. For the average elective surgery the number used to be 10 percent, now it’s 30. Patients are great volume for hospitals but they are horrible payers compared to insurance companies. They cost twice as much to collect from and they take three times as long to pay. That’s an administrative burden for the hospital-cost to collect – it’s significantly higher to collect from a patient than from a insurer,” Wilk said. To show just how much the payer landscape has shifted for hospitals, patients are now generally ranked as a top tier payer for hospitals, right after Medicare and Medicaid. Then comes PBAI and then commercial, according to Wiik. And with patients in the top of a hospital’s AR ranking, he’s seeing some clinics do deductible holds in which they delay their claim while a related hospital claim processes. They don’t send it in until the patient meets the deductible through the hospital. Once it is met then the clinic will send in their claim and get paid right away because the payer is paying, not the patient. A big part of the problem is a huge gap in benefits literacy for patients coupled with the driving force of consumerism. “They don’t understand the magnitude of the costs they they are going to get hit with. A relatively simple elective surgery will blow a $2,500 dollar deductible out of the water almost every time. Patients don’t realize that until it happens so hospitals should be engaging them early and putting patient-facing estimates in front of them. And it’s really not about collecting money from patients anymore it’s about getting them financing,” Wiik said. That means proactively setting up payment plans to spread debt out over time, which protects not only the patient experience but also the hospital’s revenue. Plus it’s a more pleasant conversation to have. If patients are a higher ranking payer, hospitals should be putting into place more policies to deal with their needs and requirements, treating them like the force they are becoming. It can be hard to do estimates and set up payment plans early because medical costs cost can vary so much, but patients want that kind of experience. They put it on the hospitals to figure out how to get them a bill that is at least close to what they were expecting, and set them up to pay for it. More than 4 million people have lost coverage in the past two years, including many lower-income adults. 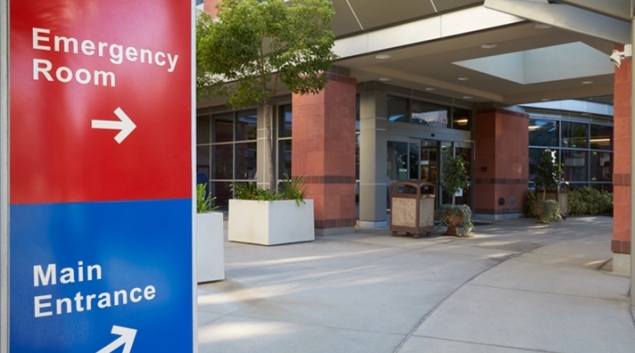 That could prove problematic for safety net hospitals in the near future. The ongoing efforts to destabilize the Affordable Care Act will adversely affect the operating margins of not-for-profit healthcare providers, according to a new analysis from S&P Global. Two years into the Trump administration’s efforts to roll back the ACA, the uninsured population has risen from about 12.7% in 2016 to 15.5% in 2018. A study by The Commonwealth Fund estimates that 4 million people have lost health insurance since 2016, and that the uninsured rate among lower-income adults rose from 21% in 2016 to 25.7% this spring. “This will be most acute at safety-net providers and other providers with a high concentration of Medicaid patients, as that population is most vulnerable to many of these changes,” Bretz said in remarks accompanying the report. “Many of the people who lose coverage seek care at our hospitals, which adds to uncompensated costs and puts more pressure on our members’ already low operating margins,” Feldpush said. “Because essential hospitals, by their mission, turn no one away, this could prove financially unsustainable for some. 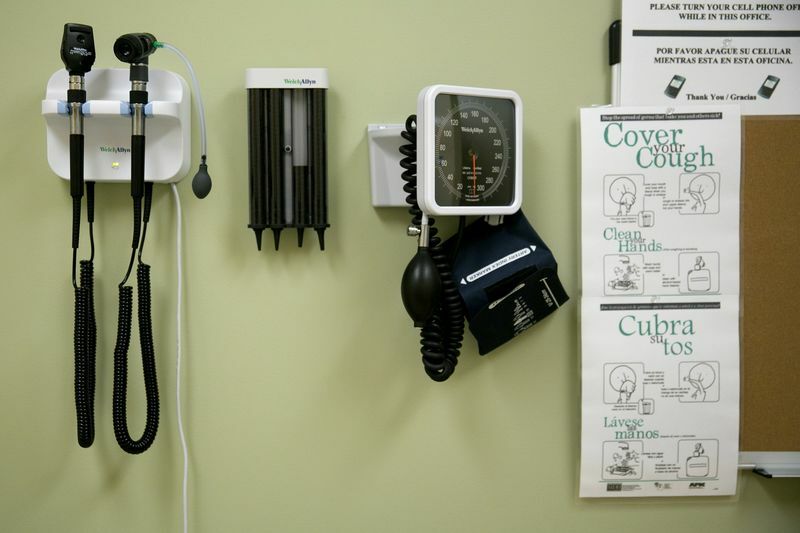 Although active efforts to repeal the ACA in Congress have slowed in the past year, it is facing one of its greatest threats, as a federal judge in Texas hears a lawsuit brought by 20 states that challenges the constitutionality of the sweeping healthcare law. While the rising uninsured rate could prove challenging for not-for-profit providers, S&P analyst David Peknay said it should have little effect on for-profit providers. “The for-profit companies we rate have been reporting some increase in uninsured patients, consistent with national trends, but the impact on ratings is also currently immaterial,” he said. The losses in covered lives for health insurance companies is offset by other factors, said S&P analyst Joseph Marinucci. “A key contributing factor is the sustained migration of the government-sponsored insurance segments toward coordinated care (Medicare Advantage and managed Medicaid), which is expanding the market opportunity for health insurers,” Marinucci said. “We expect ratings in the insurance sector to remain relatively stable in the near term despite the growth in the number of working-age uninsured individuals,” he said.